Note Rush - Learn to Read Music and Play Piano, Keyboard, Saxophone, Flute, Violin and more! A music teachers' favourite for associating notes on the staff with keys on your instrument! 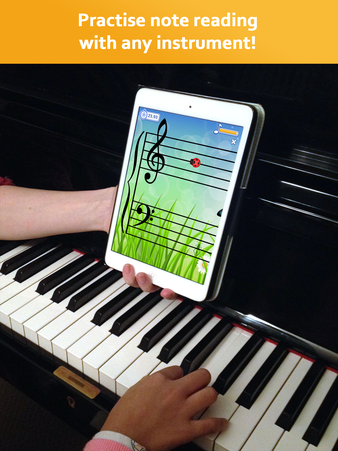 "Note Rush has quickly become my favorite app for piano teaching. ... Tell your students to buy this app instead of a box of flashcards." 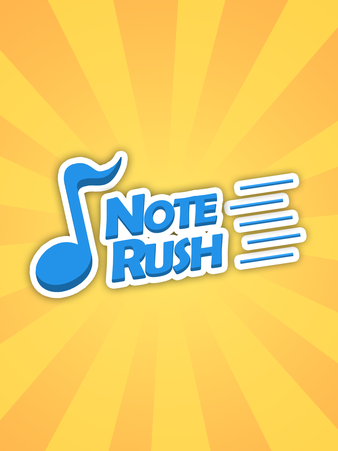 "Note Rush is a motivating app that engages students to improve quickly with their note reading skills. It is definitely one of my top favorites and will be used often!" "Note Rush is a great way to review notes for the One Minute Club." "A blockbuster hit with teachers and students... I especially like using it at group lessons." NEW: Level Designer is here! Select specific notes to drill including accidentals, and send challenges home to students! A fun game for practising note reading on the music staff to help you learn piano, keyboard, flute, saxophone, violin, or just about any other instrument! Note Rush uses the microphone to listen as you play each note like you would with flashcards, only these flashcards check that you're playing the right note! Choose from a bunch of fun themes and race to earn stars and beat your best time! Note Rush is great for teaching keyboard geography by making sure each note is played in the correct octave! A music theory must-have for mastering sight reading skills at all levels of music education. Note Rush waits as long as it takes to find each note, so even complete beginners won't feel lost. The whole grand staff is always visible, showing each note in full context and helping students learn how notes are spaced out in the two staves. 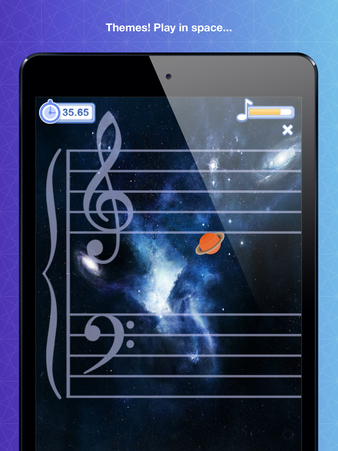 Students will rush to their instrument at home every day with NoteRush, chasing that elusive high score! Unlike flashcards, children can learn notes at home with no music-reading parent required to check if they're getting them correct! 15 Levels or Design Your Own! Note Rush has fifteen built-in Levels, from Middle C-Position right through to the full grand staff with 2 ledger lines above and below. 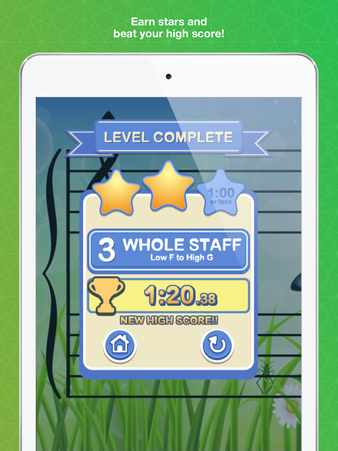 There are Levels for Treble Clef, Bass Clef or full Grand Staff! Or make your own levels to practise reading specific notes, with optional sharps and flats for an added challenge! Replace Your Flash Cards - Perfect for "One Minute Club!" Use Note Rush instead of printed flash cards. Note Rush was in-fact designed to replace the cards used in One Minute Club - a challenge you can run in your studio where students have to complete a given level in under a minute. Try it today! Does Note Rush work with Bb or other non-concert pitch instruments? Yes! Note Rush automatically adjusts to whatever tuning your instrument uses when you first play middle C - you can even use your voice! Are there any instruments it won't work with? Note Rush has been tested with a variety of instruments, but there are a lot of instruments out there, so we can't guarantee 100% success. If you have any problems please let me know! What if my piano is out of tune? As long as it is more or less in tune with itself, Note Rush should be able to adapt to it. Check the troubleshooting page for suggestions on improving note detection. Does Note Rush support MIDI? Sorry, not yet. I'm working on it though! How do you earn each star? Stars are based on average time-per-note. ie. The total time divided by the number of notes in the level. 3 stars = 2.5 seconds per note or less. 2 stars = 3.5 seconds per note or less. You get 1 star just for completing all the notes in the level. Note that this setup means you get 3 stars for completing level 3 (Whole Staff) in one minute or less, as per One Minute Club. This will subscribe you to the Note Rush mailing list. You will receive periodic updates regarding new features and special offers. Unsubscribe at any time.